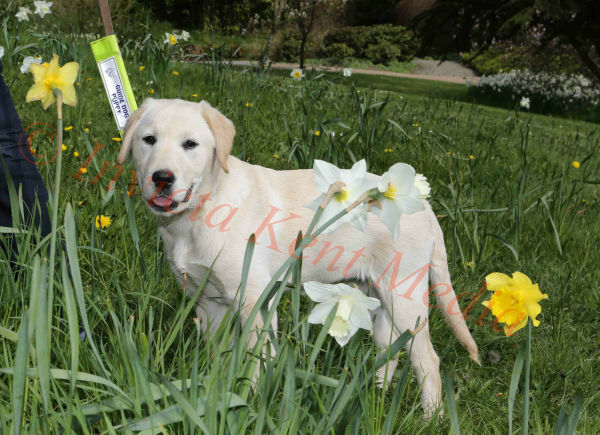 INVICTA KENT MEDIA: PIC SHOWS;- 4 month old Maisie enjoys the daffodils at Chartwell, while training to be a Guide Dog. Press call for Go Walkies ,with the Sevenoaks, Kent, Branch of Guide Dogs, at Chartwell, Kent, the old home of Winston Churchill. PIC SHOWS;- 4 month old Maisie enjoys the daffodils at Chartwell, while training to be a Guide Dog. Press call for Go Walkies ,with the Sevenoaks, Kent, Branch of Guide Dogs, at Chartwell, Kent, the old home of Winston Churchill.